Is someone "eggs-pecting?" 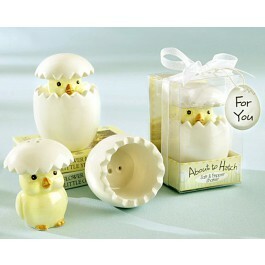 Here's an "eggs-citing" favor certain to spice up any baby shower and give your guests an "eggs-ceptional" gift. 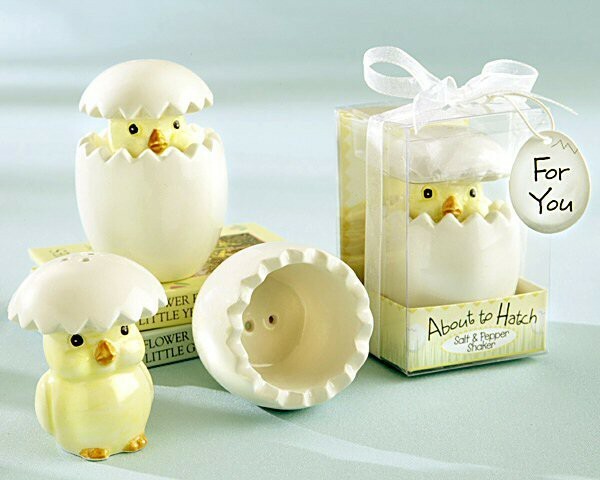 The "About to Hatch" Salt & Pepper Shaker is a "cracked" ceramic egg with a pale-yellow, chubby-cheeked chick - wearing the top of the egg as a hat-peeking out at the world. Salt shakes from the top of the little chick's "hat," while pepper sprinkles from the bottom part of the egg. Just the thing to give your shower a little something "eggs-tra!" The showcase gift box says "Grade A" on the back and "About to Hatch" on the front. Accented with a delicate organza bow and an egg-shaped "For You" tag, the gift box measures 2" x 2" x 3", and the shaker measures 2 3/4" high x 1 3/4" in diameter.